By any measure, Townes Van Zandt lived a fairly punishing life. Beholden to drug and alcohol addiction, weighed down by bipolar depression, cursed with the destruction of his long term memory via insulin shock therapy (a fairly brutal and outdated psychiatric treatment wherein patients were injected with large quantities of insulin in order to induce daily comas), and woefully underappreciated during his lifetime, Van Zandt existed on the fringes of public consciousness even as he wavered in and out of his own. His songs, while oftentimes beautiful and elegiac (and perversely funny), have an inherent ghostly and haunted quality that sets them apart from the output of contemporaries like Steve Earle and Bob Dylan. While both of those artists deal with violence and darkness at times in their work, neither come close to approximating the bleak and physically palpable emptiness billowing throughout Van Zandt's material. Van Zandt simply conjured up something more painful and destroyed in his vision, a skeletal wisp of what his life should have been. Even in 1975, when Van Zandt was still relatively young and handsome, you could see the inevitable path of his own annihilation. His life was as damaged as his songs. Fitting, then, that Neurot Recordings should release a tribute album to the man. A fairly cult label themselves despite the "high profile" recognition that comes from being owned and operated by Neurosis, Neurot have unleashed an astonishing variety of artists and sounds whose collective work somehow constitutes a thematic whole. From the utter belligerence of Skullflower to the expansive anxietyscapes of MGR and Sir DSS and the restless melodic vacuum of Final, Neurot have sought out musical loners and hermits who have carved out their visions in song with little regard for outside reception. Like Neurosis (and perhaps Townes Van Zandt himself), the power of the label lies in the reach and overwhelming emotional wipeout of the offerings. "Songs of Townes Van Zandt" is no different: it's an emotionally crippling and gorgeously fragile collection of songs performed by three musical outsiders, all of whose standard approach is steeped in towers of electricity and maelstroms of guitar roar, here tempered to a scarring and frightening intimacy that lets the songs say virtually everything, free of distraction or needless extrapolation. Steve Von Till's three contributions are the most easily lovely of the three, with gently strummed acoustic guitars cradling his warm and gravelly voice, creating an atmosphere of welcome and respite from the horrid storms of the outside world. Some rock elements do weave their way in to his interpretations (such as the chiming reverbed electric guitars on "If I Needed You"), and "The Snake Song" seems closer to his work as Harvestman with its droning kosmiche synthesizers and repetitive drum beats, but there's nothing in Von Till's approach that at all detracts from the simple majesty of Van Zandt's compositions. Instead his versions of the songs hint at a darkness existing in the corners, sneaking in, growing, encroaching. It's a feeling deeply embedded in the original compositions: that Von Till so effectively summons them with such minimal accompaniments (especially when weighed against the bombast of Neurosis) speaks to his considerable depth as an arranger and solo performer. Scott Kelly's three takes on Van Zandt play it even closer to the chest, with nary a sound heard (or necessary) beyond the sparse relationship of guitar and voice. Kelly's versions are faithful and heartfelt; only "Lungs" deviates from the original structure, here given a more droning, desert-swept form not far removed from Earth's undersung "Pentastar: In the Style of Demons" LP. Kelly tackles more narrative minded Van Zandt songs, pieces that seem to reach back into the golden days of murder ballads and ironic moral lessons. His voice is more broken than Von Till's, and more menacing; Kelly's growls on "Lungs" and "St. John the Gambler" seem tailor made to serve as warnings as much as they do to deliver colorful tales of gutter-vision falls from human grace. The pacing here is more tempered as well, with "Tecumseh Valley" stretching itself out over a languid but never dull seven minutes. Kelly's commanding voice makes Van Zandt's songs even more hypnotic and captivating than they already are, reaching a peak of personal commencement with the material that rivals their original forms. The sparsest treatment of Van Zandt's songs, though, and perhaps thus the most successful on this record, is Wino's. Never going anywhere beyond guitar and voice, and never succumbing to the idea of reimagining the material, Wino's treatments represent the ultimate purity of Van Zandt's original vision, distilling the songs to their absolute and total essences: the bleak and depressing void awaiting all of us when we pass out of the earthly realm. Wino's voice is almost as worn as Van Zandt's without the grit of Von Till or Kelly; he somehow seems more untouched and dreamy, a traveler from beyond delivering sermons of personal apocalypse and impending psychic collapse. The songs are the focus, and they simply are what they are: one man and one guitar, wielding more power than a thousand electric guitars combined. There is a volume present here that exceeds comprehension, a masterful exploration of emotion and resonance that excises any need for electricity in favor of the immediacy of direct communication. This could be Van Zandt in your living room as much as it's Wino in your headphones: that ghostly quality is full-borne here, flying on tattered wings of decimated hopes and extinguished dreams. 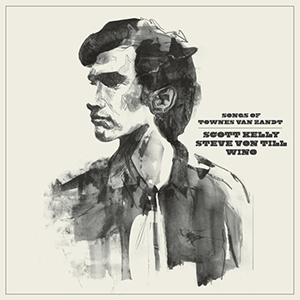 "Songs of Townes Van Zandt" is nothing short of an amazing listening experience. Rarely have I felt so drawn in and made a party to what I was hearing; across these nine beautiful tracks I feel like I've been clutched close and taken across a vast expanse of personal devastation and loneliness, visiting plains of yearning and fields of ever-growing detachment. The sorrow that haunted Van Zandt's songwriting is given full bloom by these three interpreters, along with an incredible sense of exhaustion, futility, and the dusty limits of history. The cover art is wonderfully fitting, a sketch of Van Zandt that fills in few of his features but looks so much like a wanted poster from the old American West you can't help but feel some sort of danger emanating from it. Who was this person? Why is he wanted? What did he do? What did he leave behind? Steve Von Till, Scott Kelly, and Wino have sought to flesh out the answers to some of these questions. While the answers themselves may be emotionally difficult to fathom, the explanations are beautifully simple and direct. One of my favorites of 2012.